Yerevan, May 21, 2015 – Within the framework of the Hayastan All-Armenian Fund Board of Trustees’ annual meeting in Yerevan, a delegation led by Executive Director Ara Vardanyan and comprising trustees, representatives of affiliates worldwide, benefactors, and associates began a string of project-site visits and opening ceremonies of newly completed projects in Artsakh and Armenia. The events, which were kicked off in Artsakh on May 20, will continue through May 25. The delegation traveled to Artsakh via the Vardenis-Martakert Highway. A large-scale construction project, the highway will be fully paved this year, as planned for the second phase of implementation. On May 21, the delegation held opening ceremonies for the newly built community centers of Patara and Khantsk, villages in the Askeran Region. The construction of Patara’s community center was made possible by the financial support of the fund’s French affiliate, with additional support from the government of Artsakh. The two-story community center houses the mayor’s office, a medical clinic, a library, and a computer room, with an adjacent events hall. 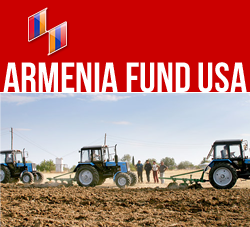 Currently the Hayastan All-Armenian Fund is building additional community centers and schools in Artsakh with the sponsorship of the French-Armenian community. The construction of the Khantsk community center was co-sponsored by the fund’s Montreal affiliate and the government of Artsakh. Also a two-story, multifunctional structure, the Khantsk community center houses the mayor’s office, a health clinic, a library, a computer room, and a game room, as well as an adjacent events hall with a seating capacity of 150. The community centers of Patara and Khantsk, like scores of other similar structures built by the fund across Armenia and Artsakh, are breathing new life into towns and villages, by addressing many core community needs. Following the Khantsk event, the delegation visited the village of Ivanyan, in the Askeran Region, where the fund is building a kindergarten with the co-sponsorship of the Toronto affiliate and the government of Artsakh. The approximately 420-square-meter kindergarten is designed to accommodate up to 70 children. With sponsorship of Toronto-Armenians also a community center is being constructed next to the kindergarten. On the evening of May 21, the delegation will attend a concert at Stepanaker’s Sayat Nova music college. The concert is organized by the college in honor of the guests. The Sayat Nova music college, which recently underwent a complete renovation with the support of the Hayastan All-Armenian Fund, hosts different educational and cultural events. Last year it hosted a visit by world-renowned soprano Montserrat Caballe who also gave a concert in Stepanakert.